MudPuppy‘s elegant Hanging Pods can be used to create a serene suspended garden in any space! 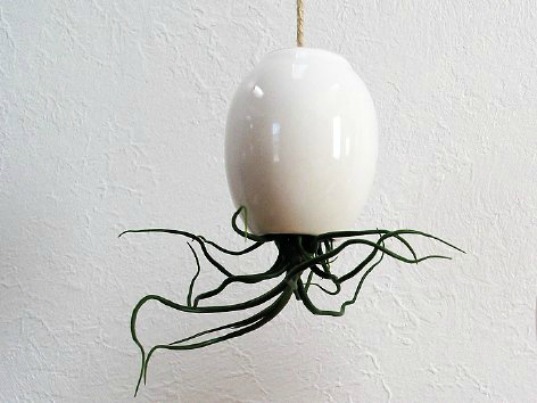 Ceramicist Mike McDowell designed the hanging planters specifically for holding Tillandsia air plants. These amazing plants gather most of the moisture they need from their leaves, so they do not need extensive root systems – a characteristic beautifully exhibited by McDowell’s design. The pods are coated inside and out with glossy white glaze and come complete with natural hemp cord, so they’re ready to be suspended in mid-air. They are fairly small at just 3 1/4″ long, and we think they would look great hanging in clusters either indoors or outdoors. For a change, the pods can also be stood on a shelf or a table. Each pod is sold individually and comes with a useful set of instructions that explain how to care for the plants. Indoor gardens can easily start filling up floor space, but why stop there when you can grow plants in mid air with these elegant Hanging Pods. 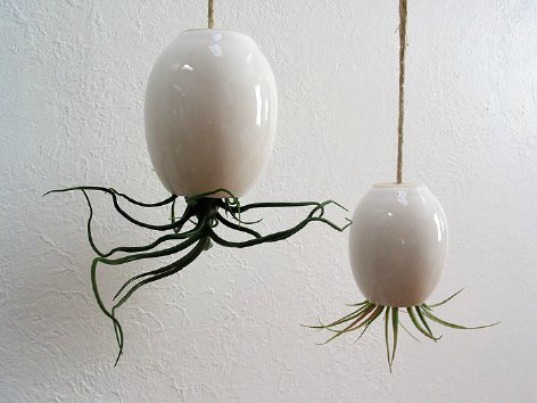 The ceramic designs are by ceramicist McDowell of MudPuppy Ceramics, who specifically designed the pods for air plants (Tillandsia). McDowell says after finding out that tillandsias will not survive in standing water, the only thing to do was to craft a perfect home for the delicate plant.